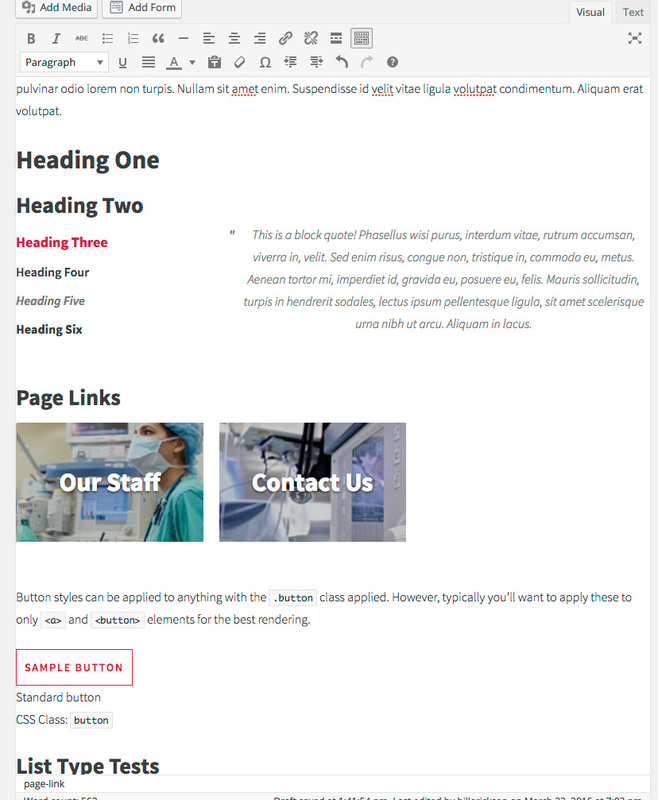 Editor Styles allow you to provide the CSS used by WordPress’ Visual Editor so that it can match the frontend styling. This allows content creators a better picture of what their content will look like while they are creating it. I’ve arranged my theme’s main stylesheet so that more generic styles come first, followed by theme-specific styling. Once I’m finished with the base styling, I copy the top half of my stylesheet into editor-style.css. I use @import to include any custom fonts (ex: Google Fonts, Icon Fonts…), and include the following sections from my main stylesheet: Base Typography (body, a, strong…), Headings, Images, Forms (input, select, buttons…), Gallery, Tables, Column Classes, and any Shortcake Styling.